What a delightful respite it is, after a busy day afoot, of bowing to social postures, to repair in leisurely fashion alongside one’s faithful pit. True and ever-stoic, standing at the ready for thee to beckon. For no higher calling becomes a pit than to procure its master a tasty supper, from whom’s menu the list runs long. And amid the smoke which rises there, what too, heady memories are forged, patron to that hot grate, perfectly seared meats, and the fellowship of the coals. 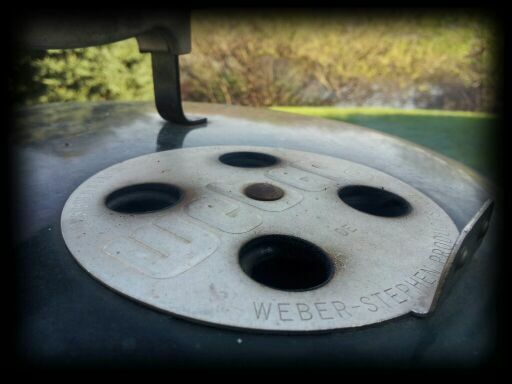 Many a grill keeper feels this twinkle pressing upon their souls, and often pines the day long for to smoke some thing savory again, under that beat up lid, beneath puffy clouds idle in a blue sky, and next to where the grass grows ever-green. We dwell on it in point of fact, more than we’d care to admit, always wondering what our next cookout might entail. And when might that be. For a Patron of the Pit, well, some might say our coals never quite get cold all the way through, before the next cook begins. An exaggeration of course, but this time of year, it is truly an effort not to cook out-of-doors. For our hearts they tarry long under lovely skies, and warm breezes. We revel in the freshened air, and the bird song aloft. The fragrance of the spruce, and the mingling hickory smoke which curls softly from our cookers. These, and many more are the simple pleasures patron to the pit. Why it is we must jockey for the door, and feel that sun on our face. 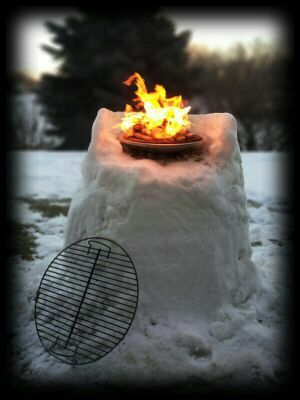 And simple meals one would normally fire up the kitchen range for, we of course adapt it for the pit instead. If for no other reason than we just cannot divine being inside when weather is at a premium. In case of point tonight, we do an old classic with a twist. 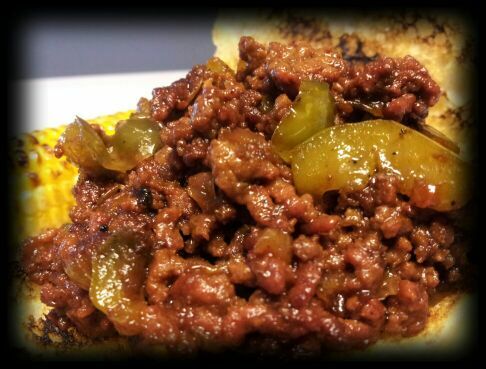 The infamous loose meat sandwich, better known as the Sloppy Joe. Yes, all things can be done, and done with great effect, on a good grill. 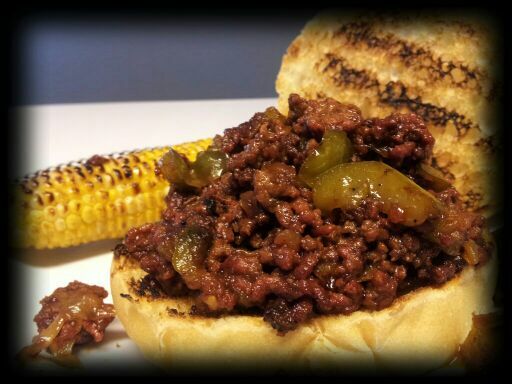 Ever had a hickory smoked Sloppy Joe? If not, well, you’re missing out. And you probably should finish reading this too , lest your Sloppy Joe’s reign ever smokeless. A sad plight indeed. 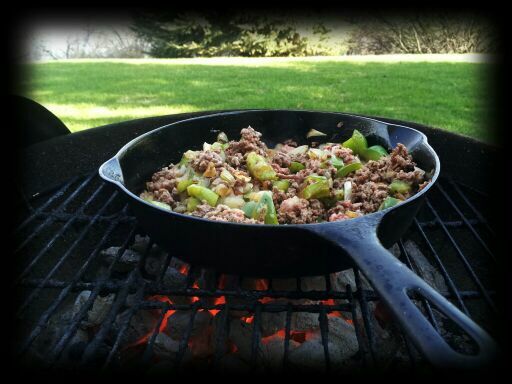 First order of operations is to brown your ground beef with some onion and green pepper in black iron pan. You all know how to do that. In fact, just make your Sloppy Joe however you’re used to. It’s all good. The only difference here is of smoke. 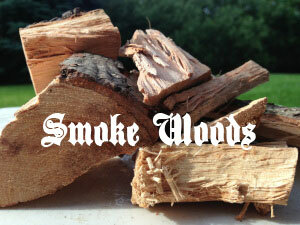 For that you’ll want some smoke wood adept with the redder meats, such as hickory or mesquite or cherry. After the meat, peppers, and onions were browned up, I added some ketchup, mustard, garlic salt, brown sugar, and pepper, and stirred up this meatiest of bouquets. Delicate aromas of meat and sweet waft about the pit. Man! Now the good part. Pull the pan over opposite the hot coals, and put on your wood. Lay it directly on the coals of course. We used hickory for this smoke, and man did that hit it. Put on the lid, and make sure the vent on top is open and directly over your spoils, thus to create a natural draft of smoke past your meat. Let the pan simmer for half hour or so, and very occasionally stir the meat about, bringing the meat from the bottom up to the top. Doing the best of your pit keeper’s ability to keep re-acquainting the contents of the pan with endless barrages hickory smoke. Keep cycling the meat about in a smokey parade. This to an end, is a beautiful destiny not often bequeathed the humble, tho beloved, loose meat sandwich – but should be. Oh glory! After a fashion, go head and do the honorable thing and take a taste for quality control reasons. I certainly did. We who cook often must do such things. For we do not want some misguided spoil cast haphazardly into the feeding pool of our people. So take a spoon full, and see what you think. You might have to bathe it longer in smoke, or it might be good enough, that is left to your considerable pit master instincts. Then grill up some sides, such as corn on the cob plucked fresh from the grocer, and toast your buns for that winning edge. Plate up these succulent, hickory-tinted sandwiches, and tower that meat high boys, for this is your feast. And these were the days. Hickory Smoked Sloppy Joe Sandwiches. Man! Oh you could have done them on the stove top like you have done all your life – but when it comes down to it, everything is just better out-of-doors. Amen. This entry was posted on May 17, 2013 by Patrons of the Pit. It was filed under Uncategorized and was tagged with barbecue, barbeque, bbq, charcoal, cooking, food, foodie, grilling, loose meat sandwich, meat sandwich, simple pleasures, sloppy joe, smoked sloppy joes, writing. That looks great-we must be thinking the same thing-I am all sloppy Joe over here too! 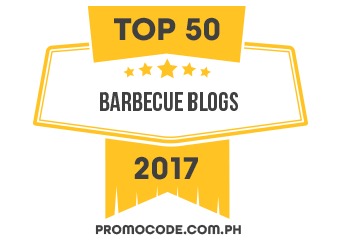 Great Blog-I can smell the smoke from here and I love it! Amen! I am working on grilling pizza now!! Awesome! Hope it turns out for you! Amen, amen to that fair pray say I, and then end life when I end loyalty. Patrons I raise a glass of mead to you..
As you would say – grill on! You know, of course, that I’ll be whipping this up with wild pork and venison! Your awesome photos inspired me, though! What kind of buns did you use? They look particularly tasty. Mrs Deerslayer, those would be good old kaiser rolls. Tasty. But then I have had my sloppy joe on plain old white bread before too, and thought it was great. Not too picky I reckon. I second that notion! Everything taste better outside, but at the beach … now that would take it over the top! Happy ALOHA Friday! Thank you much, kandee. Will do! You break out that motor cycle yet? Oh yes … vacation all last week. It was WONDERFUL!! With the return of the nice weather, there’s just soooo much to do outside … been neglecting my Blog 😦 Will hafta post about my smoked ribs the other night … stay hungry lads!! Great post again, always eloquent and knowledgeable about culinary delights. Those sloppy joes look good. My wife’s son and family came up for the weekend and I set up a new campground for them ( we have forty acres ) and I created a pit with good backing rocks, flat rocks for pans and a hole for the camp oven to go in. We sat around on wooden blocks that I’d cut and drank coffee and beer while his stew cooked in the oven. I had two helpings and finished what my wife couldn’t. it was exquisite. You can’t beat campfire cooking. When it got dark and cool the kids had marshmallows. What a great night, we went back to the house and left them to their tent. You blokes are inspirational. Lovely story, Laurie. Quite enjoyed it. There is something soothing indeed, about open fire cooking, surrounded by a beautiful place, and faces of loved ones reflected by the fire. We love it too. In point of fact, we go camping more than any ten men I know, and love to cook our spoils by this means. Some write ups on such endeavors are certainly to come. yes, smoke would make sloppy joes better! Oh the possibilities… What can’t you make on the grill? Ice cream! Hmm, smoked ice cream? Naw!! Indeed. Well said Will. It is good amid all this blogging, and words chattered, to have shared this sentiment with you.